Here’s a great solution for your New Years outfit men. You can look dapper, neat, and distinguished while maintaining your edge and modernity. These Bonnie Heart Clyde ties are too fun. They’re hand embroidered to boot. I love the skull one. 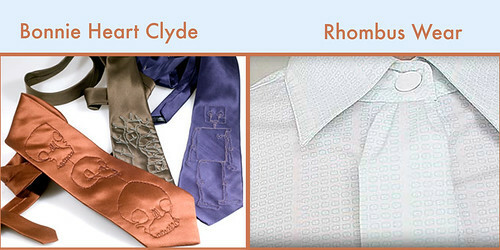 Or try this built in tie on this great shirt via Rhombus. Clever and fun. It’ll be a great conversation starter at the party and girls will be sure to come up close and check it out…surely leading to a midnight kiss.